The IDC has partnered with the Innovation Hub and Wits Business School in the founding of Startup Nations South Africa, a globally connected initiative aimed at “sparking, seeding and sustaining” a vibrant entrepreneurship culture in the country. 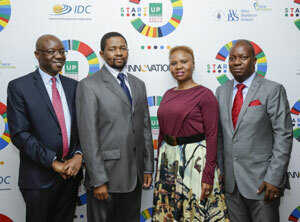 The Industrial Development Corporation (IDC) has partnered with the Innovation Hub and Wits Business School in the founding of Startup Nations South Africa, a globally connected initiative aimed at “sparking, seeding and sustaining” a vibrant entrepreneurship culture in the country. Launched in Johannesburg on Monday, 10 November, Startup Nations South Africa will promote a national agenda for entrepreneurship in order to build an environment in which start-ups and small businesses can contribute fully to economic growth and job creation. Addressing the launch, Small Business Development Minister Lindiwe Zulu cited the 2012 annual survey of the Global Entrepreneurship Monitor, which found that South Africa has extremely low rates of entrepreneurship compared to the rest of Africa and the world, combined with high rates of failure for small businesses starting out in the country. Zulu said the government saw small businesses and co-operatives as critical to creating an economy that benefited all South Africans. It was through interventions such as Startup Nations South Africa “that we will be able to defeat the triple challenge of poverty, unemployment and inequality”. Startup Nations South Africa will seek to do this by creating a national platform for collaboration between the public and private sectors, civil society and academia, while tapping into the expertise of a global entrepreneurship development network. South Africa is the first African country to join the growing Startup Nations international network, whose 35 current members include Australia, Brazil, Chile, China, Korea, Norway, the UK and Vietnam. IDC Chief Executive Geoffrey Qhena, also speaking at the launch, said that small and start-up businesses needed to broaden their scope and take advantage of new opportunities that were opening up in South Africa. “The IDC is one of the biggest funders, if not the biggest funder, of the green economy in SA, and we have to use these renewable energy projects to add additional capacity and skills to our manufacturing capabilities,” Qhena said. At the same time, the country’s state-owned enterprises had embarked on a five-year, R845-billion infrastructure build programme covering not only transport and electricity generation but also a range of public infrastructure such as schools, clinics and recreational facilities. This is where Startup Nations South Africa came in, Qhena said: through its collaboration platform and community activations, entrepreneurs “should be better able to identify the growth opportunities and enabled to harness these to build new multi-nationals”. Besides its knowledge-sharing, Qhena said, the initiative would also help entrepreneurs to access financial and non-financial support, while helping policymakers by conducting the empirical research needed to arrive at evidence-based policies that were appropriate to the South African context. Innovation Hub CEO McLean Sibanda, in his address, said Startup Nations SA was committed to going beyond offering “How to Start a Small Business in 10 Days” seminars to providing “in-depth knowledge, support and tools that are relevant to youth and small businesses in our country today”. Membership of the Startup Nations global movement brought with it access to the research and knowledge resources of the US-based Kauffman Foundation, Sibanda said, adding that the Innovation Hub had already partnered with the SA Black Entrepreneurship Forum in running two Township Startup Weekends in Soweto, “offering in our communities the same tools, learning and expertise available to entrepreneurs globally”. Locally, Startup Nations SA has begun building a knowledge network of innovation and entrepreneur thought leaders to provide guidance on using the platform to create a genuine, long-term impact in the country. Mthuli Ncube, former chief economist and vice-president of the African Development Bank, now associate professor at Oxford University. Barry Dwolatsky, director of the Joburg Centre for Software Engineering. Boris Urban, who holds the Chair in Entrepreneurship at Wits University. Thulani Fakude, member of the World Economic Forum’s Global Shapers forum. Allon Riaz, best-selling entrepreneurship author and founder of privately held business incubator Raizcorp. Raelene Rorke, co-founder of youth leadership movement SpringAge. Matsi Modise, executive director of the South African Black Entrepreneurs Forum.